The University of Munich prided itself upon having the chairs occupied by eminent professors, well known beyond the confines of the city and of Germany. In 1912 some of the celebrities were H. Wölfflin for History of Art, L. Brentano for Economics, Amira for History, O. Hertwig for Zoology, P. Groth for Mineralogy and Crystallography, W. C. Röntgen for Experimental Physics and A. Sommerfeld for Theoretical Physics. The last three are of particular interest for our subject and may therefore be characterized in some detail. Each was head of an Institute with Assistants, Lecturers (Privatdozenten) or Assistant Professors (a.o. [= ausserordentlicher] Professor) and other staff attached to it. a. Rõntgen's Institute was by far the largest of the three and was situated in a separate three-storey building in the main block of University buildings between the Ludwigstrasse and the Amalienstrasse. Besides the science students, the numerous medical students were supposed to go to Röntgen's lecture course and first-year laboratory and this demanded a large number of assistants and lecturers. P. P. Koch was already mentioned above, and E. Wagner will be mentioned later. E. von Angerer, who later became Professor at the Technical University in Munich and is well known as the author of several very useful books on the techniques of physical experimentation, was a third assistant. Röntgen had some 12-15 doctorands who were being looked after by the assistants and himself. As a 'doctor-father' Röntgen was, as in his own work, very exacting and 3-4 years full-time work on the thesis was not unusual. He demanded all possible precautions to be taken against errors and wrong interpretations and the maximum of accuracy to be obtained. 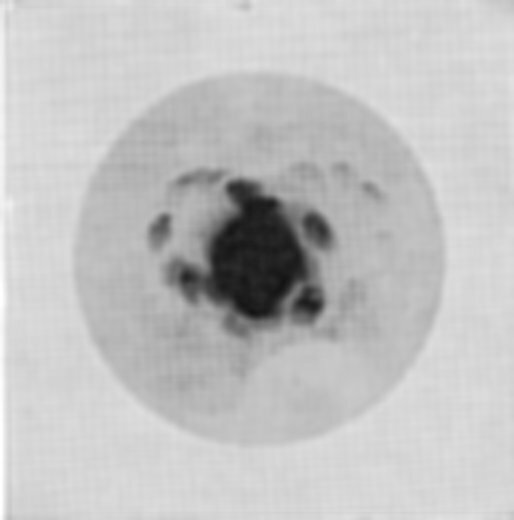 E. v. Angerer (1905): Bolometric (absolute) energy measurement of X-rays. E. Bassler (1907): Polarization of X-rays. W. Friedrich (1911): Emission by a platinum target. R. Glocker (1914): Study of interference. Much of Röntgen's own work was spent on the electrical conductivity generated by X-ray irradiation in calcite (published 1907) and in other crystals. The greater part of this painstaking work was done together with A. Joffé, who had come to him after his graduation at the St. Petersburg Technological Institute in 1902, obtained his Ph. D. under Röntgen in 1905, and stayed with him for another year as assistant. It was, however, not before 1913 and 1921, respectively, that Röntgen felt satisfied with the checking of the measurements so as to release them for publication. Because of the exceptionally high demands, graduation under Röntgen was attempted only by highly devoted and serious students. They were expected to work independently, and even too much communication from door to door in the institute was not encouraged. b. Sommerfeld's much smaller Institute for Theoretical Physics was an academic novelty. Sommerfeld had insisted on it before accepting the chair of theoretical physics in Munich which had been vacant for four years following L. Boltzmann's departure to Vienna. It had not been quite easy to overcome the obvious argument that theory demanded a library, and desks, but no experimental facilities. Sommerfeld, however, succeeded in convincing the faculty and the ministry of the necessity for a theoretician to keep in close touch with physical reality if his work was to obtain purpose and inspiration from physics. In contrast to an Institute of Experimental Physics which is equipped for experimenting in any field of physics, the Theoretical Physics Institute would need only special equipment for supporting experimentally the lines of theoretical research. At first, Sommerfeld's institute was situated in the 'Old Academy' or 'Augustinerstock' in the Neuhauserstrasse in Munich, where the Bavarian Academy of Arts and Science held its meetings and where also the zoological, geological and mineralogical Institutes of the University were housed. With the completion of the University extension along Amalienstrasse, the Institute moved in 1910 to part of the ground floor and basement there, in close proximity to Röntgen's Institute. It consisted of a small lecture theatre for about 60, a museum room for equipment (containing a.o. the models constructed by Sohncke from cigarboxes for demonstrating his 65 point systems), four offices, and, in the spacious basement, a workshop, a dark room, and four experimental and storage rooms. Apart from the occasional preparations of demonstrations for Sommerfeld's lecture course on Theoretical Physics, the main experimental work set up after the move to the new premises was an experimental investigation on the onset of turbulence in fluid motion in an open channel; Sommerfeld had been long interested in the problems of turbulence, and this particular work was performed by his doctorand Ludwig Hopf. In 1911, Sommerfeld appointed W. Friedrich as second assistant in order to make further experimental checks on the theory of X-rays, as mentioned above. Up to then there had been only one assistant at the Institute, P, Debye, whom Sommerfeld had taken with him from Aachen to Munich, when he accepted the chair. Needless to say to those who know of his later development, Debye was, even then, an outstanding physicist, mathematician and helpful friend. He was, not less than Sommerfeld himself, a centre for the senior students and graduates frequenting the Institute and the Physics Colloquium. Of these about ten were actually working on theoretical subjects under Sommerfeld's guidance, while others, from Röntgen's and other institutes came in for occasional discussions of their problems. Even more efficiently and informally than at the Institute an exchange of views and seminar-like consultation on any subject connected with physics took place in the Café Lutz in the Hofgarten, when the weather permitted under the shade of the chestnut trees, and otherwise indoors. This was the general rallying point of physicists after lunch for a cup of coffee and the tempting cakes. Once these were consumed, the conversation which might until then have dealt with some problem in general terms, could at once be followed up with diagrams and calculations performed with pencil on the white smooth marble tops of the Café's tables - much to the dislike of the waitresses who had to scrub the tables clean afterwards. Sommerfeld and his friend R. Emden (Professor at the Technical University and well known for his pioneer work on stellar atmospheres) and also others like the mathematicians Herglotz, Carathéodory, Schoenflies when they happened to be in Munich, came to this unofficial centre of exchange of physical ideas and news. For the younger members of the group it was most exciting to watch research in the making, and to take sides in the first tentative formulation of experiments and theory. No need to say that Röntgen never came to this informal meeting - nor even to the regularly scheduled Physics Colloquium; he was dominated by a shyness that made him evade personal contacts wherever he could. In the fall of 1909 Laue joined Sommerfeld's group. He was a pupil of Planck and had obtained his degree in Berlin. After two post-doctoral years in Göttingen he returned as assistant of Planck's to Berlin and became lecturer there for two years. He was Planck's favorite disciple, but for some personal or other reason he asked for being transferred to Munich University and this was arranged. Unmarried, and devoted to Physics as he was, he soon became a leading member in all the group's activities. His interests covered the whole of physics; he wrote the first monograph on the (special) Theory of Relativity, brought from his association with Planck a deep understanding of thermodynamics and the theory of radiation and had done some profound thinking on Optics. Sommerfeld was the editor of Volume 5 of the Enzyklopaedie der mathematischen Wissenschaften which dealt with Physics and contained many very important semi-original contributions such as those by H. A. Lorentz on the Theory of Electrons, by L. Boltzmann on Kinetic Theory of Gases, by Van der Waals on the Equation of State, etc. Laue, having finished his book on Relativity, agreed to write the chapter on Wave-optics, and set to work in 1911. This was also the year that he got married to a very charming and good-looking young girl coming from a Bavarian officer's family. They established themselves in the Bismarckstrasse and kept open house for the younger members of the Physics group. c. As mentioned above, Groth's Institute for Mineralogy and Mineral Sites was in an old building near the centre of the city. This, originally an Augustine convent, had been taken over by the State during the period of secularization and had housed the Academy of Sciences and the Academy of Fine Arts. The latter obtained a handsome new building of its own at the end of Amalienstrasse, close to the main buildings of the University - see Gottfried Keller's description of its inauguration in Der Grüne Heinrich - whereupon the University, in great need of expanding, was given the vacated premises for some of its Institutes. On entering from the street one passed through a high hall and past covered stairways where the mail coaches formerly discharged their passengers, came to a large quadrangle and mounted on another broad flat stairway to Groth's institute. The balustrade, the stucco ornamentation of the walls, and the high double winged doors showed the typical 'Jesuit Style' of the first half of the eighteenth century. On passing through two very long and very high rooms where the practical classes of crystallography were held, one finally reached the door of the Geheimrat's room. After knocking and being asked inside the visitor would be confronted with a rather picturesque view. Except on the side where the tall windows admitted a flood of light and offered a fine view of roofs and parts of the old buildings near Munich's ancient cathedral, the Frauenkirche, all walls of the room were lined with Jesuit style, glass-fronted, high cases filled to the top with books, journals, manuscripts and occasional crystals. Two or three large tables stood in the room piled up with books, manuscripts, galley proofs and an odd goniometer, Bunsen burner and chemical glassware squeezed in among them. At the wall opposite to where the visitor entered he would finally detect the old-fashioned desk with a small worthy old gentleman facing the wall and turning his back to the visitor while eagerly entering the end of a sentence in a manuscript or a correction in a galley proof. This was the Geheimrat, P. von Groth, then in his early seventies. Once he was summoned from his work, Groth seemed eager to learn all the news his visitor could give him, both personal and scientific. But he was also willing to contribute to the conversation by reminiscing on his own experiences, or conversations he had had, or by offering his advice on problems about which he was consulted. His lively speech, with a strong Saxon intonation, belied his age and made the student lose the sense of distance - in strong contrast to what he felt in talking to Röntgen. Groth's first great achievement was the classification of minerals according to chemical relationship and simultaneous occurrence in sites. The principles by which he re-arranged the mineralogical collection of the University of Strassburg, while he was professor there, was widely acclaimed. He insisted on including in crystallography not only the naturally occurring minerals, but artificially prepared chemical compounds as well, and in particular he fought for the wide introduction of crystallographic methods in organic chemistry. In order to facilitate this, he wrote a much used textbook Physikalische Kristallographie. In 1877 he founded the first Journal of Crystallography and Mineralogy, omitting from it Geology, Petrography and Palaeontology which at that time were often combined with the first two subjects. His personal relations to crystallographers and mineralogists all over the world were widespread, through correspondence, his own travels, and visits of foreign colleagues of shorter or longer duration to his laboratory. This personal contact as well as the large amount of active work he devoted to the Zeitschrift für Kristallographie und Mineralogie was the reason for his Journal's international success. Groth edited 55 volumes, from 1877 to 1920; only after the Zeitschrift had been firmly established by his work as the leading journal for Crystallography, and only after Crystallography itself had acquired a new depth through Laue's and the Braggs' work, was it possible to devote the Zeitschrift entirely to Crystallography, leaving the mineralogical part to be absorbed by a number of existing journals of mineralogy. Groth's most stupendous work was the Chemische Kristallographie, five volumes which appeared between 1906 and 1919 with together 4208 pages and 3342 drawings and diagrams of crystals. The manuscript was written entirely by Groth in his tiny hand and corrected over and again by him until there was hardly a white spot left on the manuscript and again on the galley proofs. Oh for the admirable compositors in the Leipzig printing centres of the days before the general use of typewriters! The volumes contain a review of all crystallographic measurements, taking the substances in order of chemical complexity: Elements, Binary, Ternary and Higher Inorganic Compounds; Aliphatic, Aromatic and Mixed Organic Compounds. Each section is preceded by a survey of the crystal-chemical relations and includes many hints of gaps which should be filled in by further work. In many instances Groth doubted the correctness of work reported in literature, and, wherever possible, he got his pupils, assistants, or visiting colleagues to prepare the same substances again, and to crystallize and re-measure them. B. Gossner, H. Steinmetz and others carried out a great number of such assignments in the course of the years. Altogether measurements on between 9000 and 10 000 substances are critically discussed in Chemische Kristallographie, an astounding feat considering the small number of the team and the other work they had to do in routine training of students. The connection between Groth and his colleagues in Chemistry, Willstätter, Fajans and others was naturally stronger than with the physicists, but Groth's keen mind was always on the look-out for any method that could initiate a more direct approach to the problems of crystal chemistry. Towards the end of the summer semester of 1910 the present author, Paul Ewald, had belonged to the group of students centering about Sommerfeld for about two years, and he felt that he could venture to ask his teacher to accept him as a doctorand. He came to Sommerfeld's light cherry-wood desk with this proposal, whereupon Sommerfeld took a sheet out of the drawer on which were listed some ten or twelve topics suitable for doctoral theses. They ranged from hydrodynamics to improved calculations of the frequency dependence of the self-induction of solenoids and included various problems on the propagation of the waves in wireless telegraphy - all of them problems providing a sound training in solving partial differential equations with boundary values. At the end of the list stood the problem: 'To find the optical properties of an anisotropic arrangement of isotropic resonators.' Sommerfeld presented this last topic with the excuse that he should perhaps not have added it to the others since he had no definite idea of how to tackle it, whereas the other problems were solved by standard methods of which he had great experience. In spite of the warning, Ewald was immediately struck by the last topic on the list, and even if he politely postponed the decision to the next appointment a few days later, he went home determined that it would be this topic or none. When this was agreed to, at the second interview, Sommerfeld gave Ewald a reprint of Planck's paper on the Theory of Dispersion (Berlin Academy 1902), and recommended him to study H. A. Lorentz's corresponding paper. The problem just stated requires some explanation. The fact that a ray of light on entering a transparent body at an angle to the normal of the surface changes its direction is called refraction. The relation between the directions of the rays outside and inside the body is given by Snell's Law (1618), which introduces an optical property of the body, its refractive index n. This index n found a physical interpretation in the wave theory of light (in particular Augustine Fresnel, 1821) as being the ratio of the wave-velocity in free space to that in the body. Fresnel's wave theory not only predicted correctly the change of direction of the ray as a function of the angle of incidence, but also the ratios of the intensities of the incident ray to those of the two rays generated at the surface, namely the refracted ray inside the body and the reflected ray outside it (Fresnel's formulae). First, the existence of an index of refraction, and its dependence on frequency. This is the same as the question: how is it that the presence of the scattered wavelets changes the wave-velocity from its free space value c to a value q (which is smaller than c in the usual optical case of n greater than 1)? And second: How does refraction and reflection arise at the surface of the body? The first of these problems was the one treated in the theories of dispersion by H. A. Lorentz and M. Planck, though in a way whereby the wave-kinematical problem of the superposition of the wavelets to a slowly moving wave-front was eliminated. This study determined a possible mode of propagation in the interior of the body; the refraction and reflection problem was not considered and in as much as an 'incident wave' figured in these theories, its significance was obscure. It should not be assumed that the division of the problem into that of dispersion and that of refraction was understood at the beginning of Ewald's investigation - it developed clearly only in the course of the work. What Sommerfeld had in mind was this: In Planck's and also in Lorentz' then known work, an amorphous medium had been assumed, characterized by a random distribution of the resonators in space. This led, naturally, to a single value of the refractive index, valid for all directions of the light ray travelling through the medium. If the same type of resonators were placed in a lattice array, with perfect regularity but different distances along the three coordinate axes - would the dispersive and refractive properties of this medium be those of a crystal? Would there result, for a general direction of propagation, two refractive indices whose magnitude depends on the direction and the polarization of the wave? In other words, would it be unnecessary to assume an inherent anisotropy of the resonators themselves for the explanation of crystal optics ? These were the questions which preoccupied the author in the next two years. Heavy mathematics was involved in finding a general answer, and again in transforming this answer to a form where the magnitude of the effect could be calculated. All this mathematical technique was, much later, recognized as Fourier Transformation - a concept which had not yet been formed at the time - with the result that nowadays the mathematical derivations can be presented to a class of graduates in a two-hour session without undue strain. The model used for the theory was a simple orthorhombic lattice of isotropic resonators (or dipoles as they are also called); the positions of the resonators along the x, y, z Cartesian coordinate axes are (X, Y, Z) = (la, mb, nc), where l, m, n are integers ranging independently from -∞ to +∞, and a, b, c are the axes or translations of the lattice. Ewald showed that the model fulfilled the general laws of crystal optics. In order to check on the magnitude of the effect, he took, on the advice of Groth, the axial ratios of anhydrite (CaSO4), a : b : c = 0.8932 : 1 : 1.0008. The result of the calculation was that in two directions the double refraction of the model was 3-4 times the observed one, and in the third direction it was six times smaller. Since no crystal structures were known at the time and it seemed unlikely that the resonators representing anhydrite should really have the simple arrangement assumed, an agreement between the observed and calculated values would have been most unexpected. The conclusion drawn from the calculation was, however, that the structural anisotropy was ample for producing double refraction of the observed magnitude, and that in any case its effect would have to be taken into account before ascribing an inherent anisotropy to the molecular resonators. Ewald had finished his calculations and was writing out the thesis during the Christmas recess 1911 and in January 1912. In paragraph 3 of his presentation he stated the astonishing conclusion that his theory of dispersion, dealing with an unbounded crystal, had no use for an incident ray, even though this played a significant role in the existing theories of dispersion. The refractive index, like the proper frequency of a mechanical system, was determined by a free vibration of the whole system, without the need of any external excitation. Thence he concluded that in a bounded system, for instance a crystal lattice filling only the lower half of space, the incident wave must be shielded from the interior by action of the boundary, so as to allow the establishment of the self-supporting free vibration. This conclusion was only later confirmed by direct calculation, in a sequel to the abbreviated re-publication of his thesis in Annalen der Physik 1916, vol. 49, pg. 1-38 and 117-143. At the time of writing the thesis, it seemed a rather radical departure from the traditional theory. For this reason Ewald meant to discuss it with Laue who had a strong leaning towards fundamental physical issues. Laue suggested that they meet the next day - it was probably late in January 1912 - in the Institute and discuss before and after supper at his home. They met as arranged and took a detour through the Englische Garten, a park whose entrance was not far from the University. After having crossed the traffic on the Ludwigsstrasse, Ewald began telling Laue of the general problem he had been working on, because, to his astonishment, Laue had no knowledge of the problem. He explained how, in contrast to the usual theory of dispersion he assumed the resonators to be situated in a lattice array. Laue asked for the reason of this assumption. Ewald answered that crystals were thought to have such internal regularity. This seemed new to Laue. Meanwhile they were entering the park, when Laue asked: 'what is the distance between the resonators?' To this Ewald answered that it was very small compared to the wave-length of visible light, perhaps 1/500 or 1/1000 of the wave-length, but that an exact value could not be given because of the unknown nature of the 'molécules intégrantes' or 'particles' of the structure theory; that, however, the exact distance was immaterial for his problem because it was sufficient to know that it was only a minute fraction of the wave-length. Soon after this Ewald took his leave from Laue and Mrs. Laue since it was evident to him that his attempt at discussing his worries with Laue this time had failed. He submitted the thesis to the Philosophical Faculty (II. Division) on 16 February 1912 and stood the oral examination on 5 March, the date given on his Doctor Diploma. Over these events and the offers of two tempting jobs as assistant (either to Haber or to Hilbert) he forgot about Laue's interest in the passage of very short waves through a crystal. The next he heard of it was a report on Laue-Friedrich-Knipping's successful experiments which Sommerfeld gave to the Physical Society of Göttingen in June 1912. On coming home from it, Ewald at last looked at the formula recommended to Laue and found the same evening the obvious way of interpreting it geometrically for short waves by means of a lattice having translations proportional to l/a, l/b, l/c, which he called the 'reciprocal lattice', and a sphere determined by the mode of incidence of the X-rays on the crystal, which in English is called 'sphere of reflection'. The paper containing this discussion appeared in Physikalische Zeitschrift 1913, vol. 14, pg. 465-472, and its equation (8) is the formula of the thesis recommended to Laue's attention but of which he never made use. There is no indication that Laue at that stage made any attempt at consolidating his 'optical feeling' by seeking to predict the kind of phenomenon that might be expected. Besides, the Easter vacations soon began and during that period a group of physicists traditionally met in the Alps for skiing. Here Laue discussed his idea with Sommerfeld, Wien and others with the result of encountering a strong disbelief in a significant outcome of any diffraction experiment based on the regularity of the internal structure of crystals. It was argued that the inevitable temperature motion of the atoms would impair the regularity of the grating to such an extent that no pronounced diffraction maxima could be expected. This objection may have been checked by a quantitative estimate of the magnitude of the thermal displacements - although this would have had to be based on a number of uncertain assumptions seeing that no crystal structure was as yet known. An evaluation of the thermal deformation of the crystal lattice could have been made by comparing the known average thermal energy of an oscillator at room temperature to that of an oscillator of amplitude A and frequency corresponding to a 'Rest-strahl' wavelength of, say, 50 microns as for rock salt or KCl. Assuming the mass of the oscillator to equal that of the chlorine atom, an amplitude A of about 0.75 Å is obtained. This is larger than the X-ray wave-length as given by Wien (0.6 Å) or Sommerfeld (0.4 A), and thus the regular phase relations between the individual scattered wavelets, which are essential for the formation of a diffracted beam, would be destroyed. This or similar arguments seem to have weighed so heavily in Sommerfeld's mind that he was staunchly opposed to cede his newly appointed experimental assistant, Walter Friedrich, to Laue for the experiment. The situation was also discussed by Laue at the Café Lutz physics table, and here the opinion prevailed that experiment was safer than theory and that since the diffraction experiment required no elaborate set-up, it should at least be tried. Paul Knipping, who had just finished his thesis work in Röntgen's Institute, volunteered to assist, so as to reduce the time Friedrich would be taken off his work for Sommerfeld. 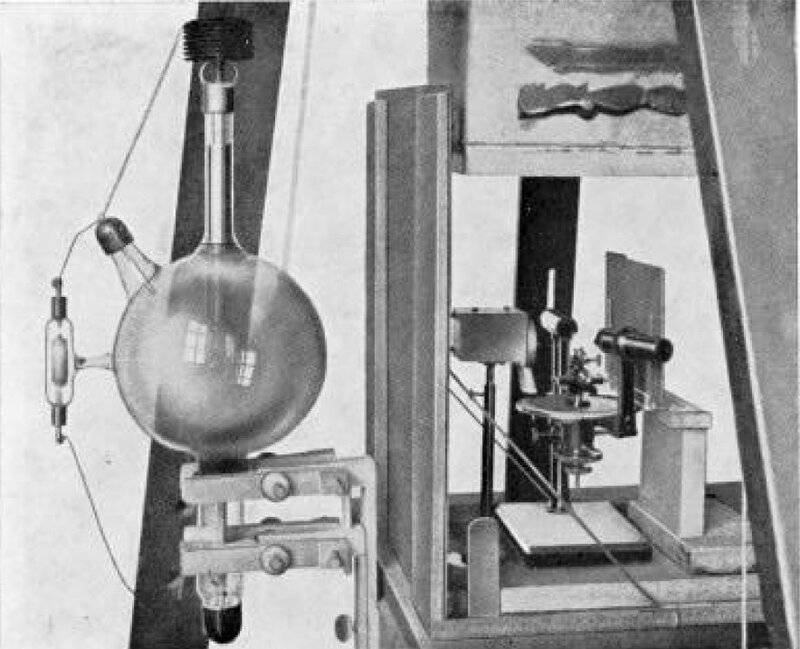 The X-ray tube, the induction coil and the Wehnelt electrolytic interrupter had to be set up anyway for Friedrich's work, so that it was an easy matter to slip in a few unscheduled runs for Laue's experiment. Once the three partners, Laue, Friedrich and Knipping had decided to go ahead, success came swiftly thanks to Friedrich's experience in X-ray experimentation. Led by the exposure times Herweg had required in his experiments on double scattering, Friedrich knew that exposures of several hours would be needed. This in turn meant careful screening of the crystal and photographic plate from the unwanted X-rays which come from the glass walls of the X-ray tube and from the mass of irradiated air. The tubes available at the time had a glass bulb of 10 cm radius and the glass wall acquired a high charge and potential while the tube was running. Any grounded lead diaphragm had to be at least 17 cm from the target in order to avoid a breakdown of the tube. The minimum distance target-crystal thus came to be about 25 cm, and this meant that only a very small fraction of the total output of the tube was used. Friedrich constructed a lead box containing the crystal and the photographic plate. It consisted of a tray of lead sheet about 12 x 7 cm with a turned-up rim, and a cover in the form of an open box about 6 cm high which could be placed with the open side on the tray, and whose side facing the tube had a hole of 3 mm diameter for admitting the X-rays. There may have been a second hole on the opposite side through which the strong primary beam passed out of the box without generating secondary X-rays by hitting on lead. For crystal, a piece of copper sulfate was used as it was found in the laboratory. In fixing the crystal on its holder by means of wax no particular orientation was aimed at. The photographic plate was placed between the X-ray tube and the crystal on the assumption that the crystal would act like a reflexion grating. The first exposure gave no effect. Thinking this negative result over, Friedrich and Knipping came to the conclusion that better success might be achieved by placing the plate behind the crystal, as for a transmission grating. Knipping insisted on placing plates all around the crystal. Fig. 4-4(1). 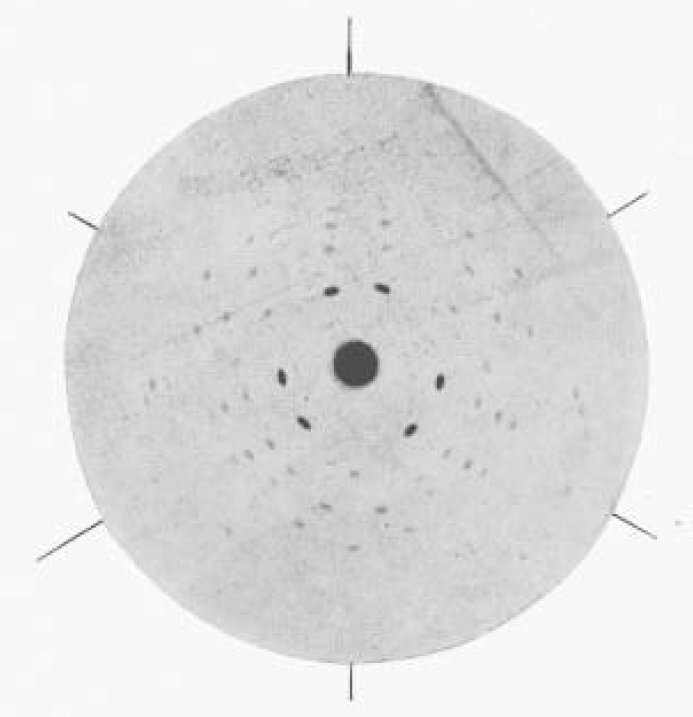 Friedrich & Knipping's first successful diffraction photograph. Röntgen was among the first who came to look at the experimental set-up and at the results. He was deeply impressed by the photographs but held back on their interpretation as difFraction. As true experimentalists Friedrich and Knipping had made sure that the crystalline nature of the sample was involved in forming the pattern. They had pulverized the crystal and kept the powder in place in a little paper box, while exposing it; the photograph showed the central spot formed by the primary beam and the rings of large spots were absent. Only very small freckles, of about the size of the powder particles, were to be seen in the region surrounding the primary spot. They also had convinced themselves that only the primary spot was formed if the sample was removed altogether. 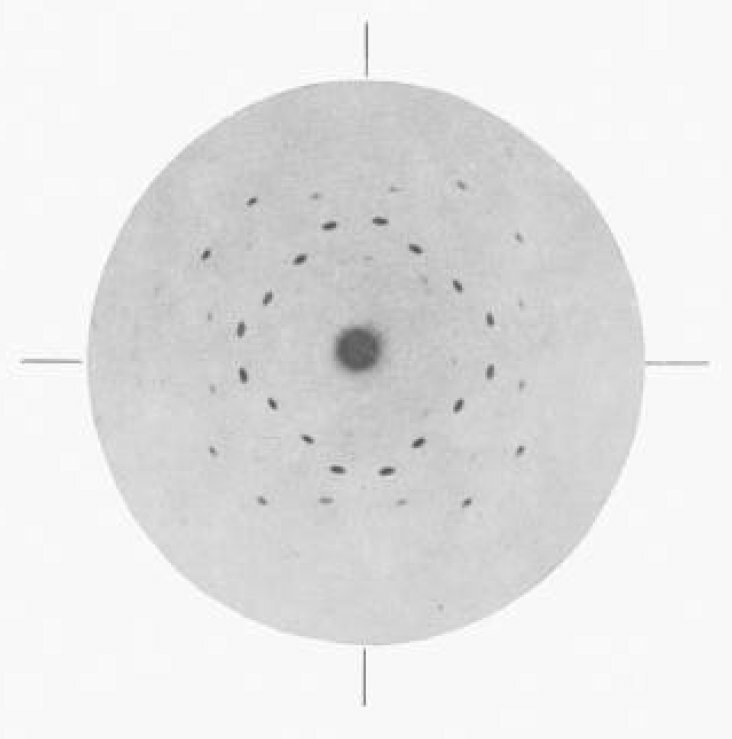 In view of these findings Röntgen had to concede that the spots on the successful photograph were caused by the presence of the crystal, but he held in abeyance his verdict as to diffraction. It must be made clear that at this time the three investigators were themselves under a misapprehension which, retrospectively, is hard to understand. They were convinced that the diffracted rays would consist of characteristic radiation emitted by the crystal under the influence of the primary, incident, ray. 'Thus', Friedrich and Knipping write in their paper, 'a crystal had to be chosen containing a metal of considerable atomic weight, in order to obtain intense and homogeneous secondary rays, as these seemed the most suitable ones for the experiment. According to Barkla, metals of atomic weight between 50 and 100 were to be taken into consideration. Since initially we had no good crystal containing such metals, we used for the preliminary trials a fairly well-developed copper sulfate crystal.' Copper has atomic weight 63.5; zinc, its neighbour in the periodic system of the elements, has weight 65.4. It is therefore very likely that the same considerations prompted the ordering of a zincblende plate from the well-known firm of Steeg and Reuter in Bad Homburg as soon as the first results were obtained. Before this plate arrived and during the period of construction of a more elaborate camera, diagrams were taken with cleavage plates of zincblende (ZnS), rocksalt (NaCl), and galena (PbS). They confirmed the experiences gained on copper sulfate. The preliminary tests had included shifting the crystal parallel to itself showing that all parts of the crystal gave the same pattern; fixing a second photographic plate behind the crystal at double the distance of the first one, on which a picture of double the size was obtained, proving that there were really secondary rays fanning out from the crystal; and finally, changing the orientation of the crystal by a few degrees and finding that the position of the spots is very sensitive to the orientation of the crystal with respect to the incident X-rays. These last observations showed the desirability of constructing an improved apparatus so that not only the direction and delimitation of the incident ray, but also the orientation of the crystal were sharply defined. Friedrich achieved this in an unsurpassed way by setting up the crystal on an accurate goniometer and using a collimating system consisting of a first, wider hole of about 3 mm diameter in a 10 mm thick lead plate followed at a distance of 70 mm by a much finer hole of 0.75 mm diameter also drilled in 10 mm thick lead. Since the shape of the fine hole actually is that of a long cylinder, it was essential to mount the second lead plate so that its plane could be adjusted by three screws; this also offered the advantage of enabling wider holes drilled in the same plate to be rotated in position for the rough adjustment. The adjustment made use of the telescope of a cathetometer which stood fixed, once for all, at a distance of about 3 m from the tube. Its optical axis was directed to the focus of the tube and formed the line on which first the coarser and then the fine hole were centered. Then, by means of a small piece of fluorescent screen and with the tube running, the shape of the primary beam was checked; the plane of the second lead piece had to be adjusted by means of the three screws until a circular picture of uniform intensity was achieved. Next came the setting of the crystal plate with its main face perpendicular to the optical axis. For this purpose a little plane mirror, mounted (on a metal strip held with wax) at the center of the front lens of the telescope, reflected light from a sideways source along the axis of the instrument. If the crystal plate reflected the light back into the telescope then it was perfectly oriented. The necessary tilt of the crystal could easily be achieved with the motions provided by the head and circle of the goniometer. Finally, the photographic plate, wrapped in black paper, was aligned in the same way as the crystal by means of a mirror temporarily clamped to its back side. The collimator, goniometer, and plate holder all stood on a lead tray, and when the adjustments were completed, a heavy leaden hood was lowered from above so as to eliminate secondary radiation. The legs of the tall wooden tripod and part of the hood suspended by it appear on the photograph of the apparatus. Fig. 4-4(2). Friedrich & Knipping's improved set-up. The working of the old-fashioned X-ray tube depends on the remnants of gas left in it, from which ions are being formed whose impact in turn liberates the electrons forming the cathode ray. The less gas there remains in the tube, the higher is the voltage that must be applied in order to pass a certain current, and the greater the energy of the electrons and the 'hardness' or penetrating power of the X-rays. Gas is emitted from the target and other metal parts of the tube as they heat up, and on the other hand gas is removed and occluded on the walls of the tube by the sputtering of cathode metal. If the tube is run at too high power, heating and with it loss of resistance of the tube prevails and if a constant voltage is maintained, the increase of current through the tube, the heating-up, and the release of gas continue until the target or some other metal part melts - and this is the end of the tube. If, on the other hand, the tube is run with too little power, scattering of metal and depletion of gas prevail; the resistance increases, and so does the peak voltage accepted from the induction coil or transformer, until the insulation suffers a breakdown, either in the coil or transformer, or by sparking through the glass of the tube - and that again is the end of the experiment. Because of this inherent instability the running of the old X-ray tubes was like walking on a mountain ridge with a precipice on either side. On the tube shown in Fig. 4-4(2) the little side tube to the utmost left is an automatic 'regeneration device.' It contains a rolled-up mica sheet, and if the main tube begins to offer too much resistance, a spark will jump from the lower pole of the tube, the cathode, to the wire brought near to it from the lower end of the regenerating device, and pass to its upper end which is permanently connected to the anode and anticathode, thereby liberating some gas occluded on the mica. In spite of such devices, the old X-ray tubes needed constant vigilance and the successful end of a long exposure for a diffraction photograph drew a sigh of relief from the operator. It was a great advance when W. D. Coolidge invented a new type of X-ray tube which has a much higher vacuum and provides the electrons for the cathode rays by a well regulated thermal emission from an incandescent wire. One of the first tubes of its kind was donated to Sommerfeld's Institute by Dr. Coolidge and was used for taking some photographs. But this work was soon interrupted by the war in 1914. The entire X-ray plant was set up in an emergency hospital and used for medical purposes. Fig. 4-4(3) and (4). Zincblende Laue photographs along four-fold and three-fold axes. (Laue, Friedrich & Knipping, Sitz.ber. Bayer. Akademie d. Wiss. 8. Juni 1912). Laue, Friedrich and Knipping's research was communicated to the Bavarian Academy of Sciences at the meetings of 8 June and 6 July 1912 by A. Sommerfeld as Fellow of the Academy. Röntgen seconded the acceptance and stressed the importance of the work. Two papers were published in the Proceedings (Sitzungsberichte) of the Academy, namely pg. 303-322 : 'Interferenz-Erscheinungen bei Röntgenstrahlen' by W. Friedrich, P. Knipping and M. Laue; and pg. 363-373: 'Eine quantitative Prüfung der Theorie für die Interferenzerscheinungen bei Röntgenstrahlen' by M. Laue. In reprint form both papers were sent out with a common paper cover. Simultaneously with Sommerfeld's presentation in Munich, Laue himself reported on his discovery to his old group of Berlin physicists at the meeting of the Berlin Physical Society of 8 June 1912. While he still resented the initial cautious-critical attitude of some of his colleagues and elders in Munich, he was warmed up by the unrestricted acceptance of his theory by the group in Berlin, and especially by the enthusiasm of the highly gifted astronomer-physicist Karl Schwarzschild. - On his return journey, Laue stopped over in Würzburg and gave a report there to Willy Wien's physics group. Erwin Madelung from Göttingen happened to be present and obtained from Laue the loan of his slides in order to show them to the colleagues in Göttingen. The first of the papers published in the Bavarian Academy contains on eight and a half pages under Laue's name an introductory paragraph, and the theory of diffraction by a three-dimensional lattice. The remaining 11 pages are signed by Friedrich and Knipping and describe the preliminary and the final experiments. Eleven Laue diagrams are beautifully reproduced by heliogravure on five plates. In the second paper, Laue applies the formulae of the general theory to a discussion of the ZnS diagram with X-rays incident along the axis of fourfold symmetry. It is, evidently, this paper and the quantitative confirmation it seemed to contain, which gave Laue the final certainty of having to do with the expected diffraction effect. The gist of the experimental part has been given in the preceding section, but Laue's theoretical contribution has yet to be reviewed. We begin with the first part of the first paper. Using Cartesian coordinates and the (x, y, z)-components of the triclinic axial vectors or translations ai (i = 1, 2, 3), the coordinates of an atom (m, n, p) (m, n, p integers) are first written out. The assumption, usual in optics, is made that the wavelet emitted by an atom is of a definite frequency; otherwise a monochromatic Fourier component of the emission would have to be considered. It is further assumed that the excitation is in form of a plane wave progressing in the crystal and that this produces a phase factor of the wavelet according to the position of the atom. The only assumption here made, as Laue points out, is that all atoms react in the same way to the excitation. Whereas in visible optics the atom is small compared to the wave-length, and the emission is uniform to all sides, 'one has here to consider the possibility - and the experimental results seem to confirm it - that the emission depends on the direction because the distances within the atom are comparable to the wave-length'. Laue therefore introduces an amplitude factor ψ of the wavelet, which depends on the direction and wave-length. This ψ corresponds to what is nowadays called the atomic factor f.
The expression for I corresponds exactly to what Laue visualized on his way home after having seen the first successful photograph, namely the thrice applied summation of wavelets issuing from a linear lattice; for each of the sin2-quotients refers to only one of the axial directions of the crystal and the atoms aligned on it. As the direction of observation is changed, the right hand sides remain constant. Now the left-hand sides can be interpreted geometrically as the projections of a unit vector in the direction of observation (α, β, γ) on to the axes a1, a2, a3, respectively. Each projection equals the right-hand side if the vector (α, β, γ) lies on a cone of a certain opening having one of the axes ai as central line. As the integer h is changed, the opening will change; each axis is therefore surrounded by a system of co-axial cones, and these are the geometrical loci for the directions under which a diffracted ray can be observed. Now the two sets of cones around two of the axes always have a number of lines of intersection, provided their opening is wide enough. The two conditions fulfilled on such common lines are those for diffraction maxima formed by a cross-grating of atoms in the plane of the corresponding axes. Such cross-grating rays therefore will always exist; but the effects of the parallel cross-gratings, generated by the third axis or translation would be destructive, unless the third equation is also fulfilled. It will be a rare event that the direction of intersection of the first two cones also belongs to a cone of the third set. Only when this happens will there be a diffracted ray coming out of the three-dimensional lattice, Laue indicates that an approximate fulfilment of the third condition may be sufficient to produce a diffracted ray, without, however, discussing the necessary degree of approximation. Narrowing the discussion down to photograph number 5 of the paper (our fig. 4-4(3)), which was obtained with the cubic ZnS crystal plate by incidence along the fourfold symmetry axis, Laue points out that a photographic plate normal to this axis intersects two of the systems of cones in hyperbolae, and the third system in circles. These circles which are caused by the periodicity of the lattice in the direction of the incident beam are compared to Quetelet's rings in light optics: these are obtained if light falls on the surface of a dusty glass mirror and are caused by the interference of light scattered directly with that having been reflected (before or after scattering) by the silvered back side of the mirror. The two rays interfering in the optical case give rise to rings of the same radius but much greater width than those caused by the many cross-gratings of the lattice. Laue further points out that a given lattice can be described by translations in a great variety of ways and that each of these leads to a different system of conic sections on the photographic plate as locus for the spots registered. This is confirmed by the diagrams obtained with different orientations. On the whole, so Laue concludes, the diagrams seem to be explainable on the assumption that they are caused by a number of discrete wave-lengths in the range of 0.038 a to 0.15 a, where a is the axial length of the zincblende lattice. There remains, however, a difficulty in understanding how it is that the thermal motion does not wash out the interference phenomena, since it displaces the molecules over considerable fractions of the lattice constant a and therefore in some cases over several wave-lengths. It should certainly affect the sharpness of the intensity maxima. That the observed maxima form only acute angles with the incident ray (except for diamond) is most likely due to the atomic factor ψ, possibly in conjunction with the thermal agitation. The paper ends with some general conclusions concerning the bearing of the observations on the nature of X-rays, in particular whether they are composed of waves or corpuscles. For zincblende Laue obtains a = 3.38 · 10-8 cm, and a cubic cell of this size is used for the indexing, and for the conversion of the ratios λ/a, as determined from the photographs, into values of the wavelengths λ. Actually zincblende is not based on a simple cubic lattice with one molecule per elementary cube but on a face centered cubic lattice which has four molecules per cubic cell. Laue's value of a is therefore too small by a factor of . This change of scale of the lattice constant can be countered by a change in λ with respect to all geometrical properties of the diagrams (which depend only on λ/a), and it does therefore not affect the assessment of orders to the spots; but all absolute values of wave-lengths are too small by the same factor = 1.5874.
a1 = (a,0,0) a2 = (0,a,0) a3 = (0,0,a). that is, once the integers (h1, h2, h3) have been attributed to a spot, the λ/a ratio contained in the spot is fixed. where Z is the distance of the photographic plate from the crystal (3.56 cm) and φ the angle whose cosine is γ. Therefore γ can be obtained by measuring r/Z and thence from the last of the three equations above the value of ∑h2 is found, assuming a value for h3. Inserting numerical values for the innermost of the strong spots of the diagram and trying h3 = +1, Laue finds ∑h2 = 36. This makes h12 + h22 = 35 and on squared paper it is easy to find two integers having very nearly this sum, namely h1 = 3, h2 = 5 or h1 = 5, h2 = 3. The assignment can be checked by noting that the ratios 3/5 and 5/3 correspond to the actual angular positions of the two symmetrically equivalent spots shown in one quadrant of the photograph. Assuming then the indices (3, 5, 1), the value λ/a = 0.0564 follows from (5). Could the ring on which this spot is situated also be interpreted as a second order ring? In that case the indices would be (6, 10, 2), and ∑h2 = 140. There would be a ring very close to this, namely with ∑h2 = 141 on which the spot (4, 11, 2) would be expected to be formed. Of this, and its companion (11, 4, 2), however, no trace can be found. Laue next asks whether a second order ring of the observed wavelength can be seen. For it ∑h2 = 70 from (5), and h12 + h22 = 66. The nearest to this is h1 = 2, h2 = 8 giving ∑h2 = 72. This ring, of radius 1.84 cm on the plate, actually contains two spots in the quadrant under the expected azimuths. The spots (1, 8, 2) and (4, 7, 2), with ∑h2 = 69 which is even closer to the above value of 70, are not to be seen. A third order ring of radius 2.26 cm, formed by the same wavelength, should give ∑h2 = 105. Actually a spot (7, 7, 3) giving ∑h2 = 107 can be seen, whereas no trace of (4,9,3) with ∑h2 = 106 was found. Again a fourth order ring shows (8, 8, 4), whereas the spots (11, 3, 4) and (7, 9, 4), which could be expected, are absent. In this way the discussion continues, assessing indices and wavelengths to the strongest and most of the weaker spots, and pointing out that some further spots should be expected to appear because they would lie close to the observed rings, and their λ/a-values fall within the range of the observed ones, namely λ/a = 0.0377 to 0.143. The fact that all of the observed spots can be accounted for by low order interferences (h1 h2 h3), where none of the h exceeds 10, is considered by Laue a convincing argument for the correctness of the interpretation. He is aware of the fact that the ratios of the hi are based on more direct arguments than their absolute values. But multiplication with common factors, which he tried out, seemed to give no improvement. Laue is rather indefinite about the degree of accuracy with which the three conditions for maximum intensity have to be fulfilled. For this reason he is not too much perturbed by the absences of expected spots. In the 12 observed independent spots he finds 5 different wavelengths, and these, he remarks, stand approximately in the ratio of 4 : 6 : 7 : 11 : 15. He turns down the possibility of making all wavelengths integral multiples of a wave-length one quarter of the shortest one found, because then all indices would have to be multiplied by 4 and one would have to expect many more than the observed spots. Also this common wave-length would be 3.20 · 10-10 cm and the rays should be much less absorbed than they actually are. The range of wave-lengths, 1.3 · 10-9 to 5.2 · 10-9 cm, is what would be expected from Sommerfeld's determination. But how is it to be explained that these five sharply defined wavelengths emerge from the crystal? In answering this question Laue as well as his co-workers missed the point. If they had only applied the assumption underlying Laue's theory, namely that each atom scatters the incident wave as it is reached by it, then they could not have failed to see that the sharply defined wave-length is identical with periodicity in the diffracted ray produced by the periodically repeated scattering of the incident wave on successive atoms. This periodicity-producing action of a grating had been pointed out in the optical case by Lord Rayleigh and was discussed at length in Sir Arthur Schuster's Textbook on Optics. Laue, who had spent much thought on 'coherence' of light most probably had come across this discussion. But in the first papers, and for some time afterwards, Laue and Friedrich were so strongly impressed with the analogy between the monochromatic interference rays and the only other known 'homegeneous' and therefore very likely monochromatic X-rays, namely Barkla's characteristic rays, that they considered the wave-lengths obtained to be those of characteristic or fluorescence X-rays of the crystal. It will be remembered that the choice of crystal was already made with a view to production of characteristic radiation. The statement from the end of Laue's theoretical introduction of the first paper, which was quoted earlier, also clearly expresses the situation. The persistence of this misapprehension at the end of a period of the most strenuous and successful work is like a sign of exhaustion. It led, for several precious weeks, to speculations along a wrong line, and distracted from the further vigorous exploration of the points left unexplained by the remarkable quantitative discussion in the second paper. It is of interest to note in this connection that when Laue's paper was republished in Annalen der Physik (1913, 41, 998-1002) he appended three notes dated March 1913. In the first of these he develops the theory of diffraction in a crystal containing several atoms per cell. This leads to the first formulation of the Structure Factor (without introducing this name) and stresses its importance for the explanation of absent spots on the diagrams, especially in patterns produced by hemihedral crystals. The discussion is not carried through in detail, and in particular the systematic absences due to the centering of faces of the cell seem not to have been recognized. In the second note Laue explicitly refutes the idea that the monochromatic nature of the diffracted rays could be explained by a selective effect of the crystal. He argues that any direction of diffraction can be approximated by three integers h1, h2, h3, and, provided the incident X-ray has a sufficiently large spectral range, one would have to expect the photographic plate to be blackened everywhere. His conclusion is that the production of discrete wave-lengths in the diffracted rays is a property of the atoms and included in his ψ-factor, and not a property of the lattice. In the last note, indices and wave-lengths are assigned to three further weak spots on the ZnS diagram of fourfold symmetry, and it is shown that the wave-lengths, like the previously determined ones, are relatively low multiples (up to 38) of a fundamental h = 0.032 A. It is announced that the discussion of the diagram with threefold symmetry leads to the same fundamental λ. Finally Laue replaces the lattice constant of ZnS, a = 3.38 Å, which had been calculated on the assumption of one molecule per cell, by a = 8.53 Å. According to the article by A. E. C. Tutton in Nature 1912, 90, November issue, 'The Crystal Space Lattice Revealed by Röntgen Rays', structure theory makes it very likely that zincblende crystallizes with 16 molecules per cubic cell. This illustrates once again the confusing statements to which physicists were exposed in listening to the acknowledged authorities on crystals. It also serves to make clear what relief was brought about by W. L. Bragg's intrepid and direct approach.